I met Helene at last years Stanstead House Garden Show in June 2017. We discussed at length the best photo to choose of a beautiful Afghan dog of her very good friend who had lost this beautiful pet. Finally we managed to find the perfect picture with enough resolution and I thoroughly enjoyed painting this beauty. I was then so so pleased Helene was happy with my work once finished. Equally pleased that Thorian Framing were able to frame in time for Christmas and then also to get Helene’s testimonial of the present opening and her friends reaction. 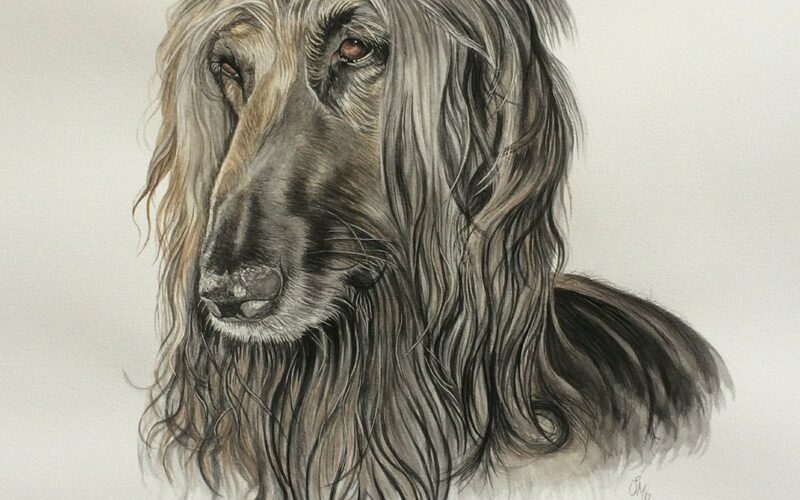 Such a pleasure not only to paint, but to get pleasure from other peoples pleasure receiving one of my paintings, especially with the connection to our love of our animals. Thank you Helene. I look forward to painting your cats one day and may be see you at this years Stanstead Garden Show on 8/9/10 June 2018.